David Guerrero's blog | All about mobile Software Development. Quite often the security aspect of our apps is not taken in consideration when we are working in our projects. Generally speaking the mobile ecosystems are perceived as very secure due the particular architecture and design of the main platforms (Android and iOS) compared to other platforms like, let’s say the Windows PC operating systems. From a user point of view there is also this relaxed perception about the security of our devices. As we are going to see in this post we should take much more seriously the security of our platform, as developers and also as users, taking into account the massive amount of personal information that we carry in our devices. And here we as developers have a big responsibility. The malware and cybersecurity threats as we know it’s not something new. Hackers are being around for a while and their practices have been evolving with the progress and evolution of the computer systems. In the early days malware were usually more kind of a joke, experiments and bit of fun with normally no much harm done in the attacked system. We remember virus like the ping-pong, bars, etc that were just an annoying joke in most cases. Later on, massive infections of more disrupting malware started to spread mainly in the Windows platform, we remember viruses like Melissa, Conficker or Sasser that infected millions of computers around the world in a few hours, and in some cases leaving the systems unusable. Pretty soon hackers realised that there was an opportunity to make money exploiting systems and vulnerabilities so this was the next logic step in the malware evolution. For example, very well known in these days are the ransomware cases where the attacker request an amount of money in order to unlock and decrypt the user machine. And last but not least we can’t forget the special interest and effort of almost all governments around the world and how they are investing fortunes in spying, attacking and influence to internal or external targets for political and strategic interests. With the popularisation of the portable devices it was a matter of time that they become the target of the bad guys who would try to access the massive amount of information collected by these powerful tools, not only personal information like bank accounts or emails but also access to critical sensors, location, microphone, camera, etc. Based on Kaspersky report for Q1 of 2017, the mobile products of the security company detected 1,333,605 malicious installation packages, 32,038 mobile banking Trojans and 218,625 mobile ransomware Trojans. One of the most common malware types identified were Trojans capable of gain super user rights. This is doable by exploiting well known vulnerabilities in older versions of Android. Unfortunately is quite common in the Android ecosystem that many devices never receive the latest updates of the OS to fix these vulnerabilities. As we can imagine, once these malicious programs has gained super user rights, the possibilities and ways to control the device are massive. Read and alter text messages, modify URLs, steal login credentials, key logging, encrypt data, etc. just to name some of them. These malware samples are not only distributed in dodgy stores, but also Google Play has been used to spread these malicious apps despite the improvements and effort from Google to increase the security and analysis of all the apps published in the market. One example as reported by Kaspersky Lab was a Trojan app that was supposed to be a Pokemon Guide. But underneath, the application contained malicious code that downloaded rooting malware and installed unsolicited apps. This application was downloaded more than 500,000 times and managed to perform at least 6,000 infections. Another example was the false OS cleaning app Wiperius, that in reality was a Ransomware tool able to encrypt the device disk and afterward demanded a ransom to unblock the phone. As we can see the mobile platforms are not so secure as most of users might think, compared to other traditionally more affected platforms like Windows. So from a developer point of view, what can we do to make our apps more secure? How can we avoid hackers trying to break into our systems? How can we keep the personal data of our users safe and sound? OWASP is a non profit organisation and an open community dedicated to help organisations to develop, maintain and operate Software that can be trusted. As part of the organisation there is the OWASP Mobile Security Project with the goal of classify mobile security risk and provide resources to mitigate the risk and impact of any possible threat, with the focus on the developers and at application level where we can make a difference in our apps. They provide a few really helpful tools and frameworks like the Mobile Security Check List and Testing Guide, a list of tools and one particularly interesting for us as developers which we are going to focus our attention now, The Top 10 Mobile Risks. Misuse of a platform feature or failure to use the OS security controls, like Intents in Android, permissions, misuse of Touch ID, etc. For example asking for too many or risky permissions can provoke misuse of them and increase the risk of an attack. Or using implicit Intents to run a Service, because you don’t know which service will respond to the Intent. We can find here the official Android documentation about security tips and good practices. Insecure data storage includes things like SQL Databases, Log files, binary data, resource files, etc. For example, an app that is logging publicly critical or sensitive information of a user, or a “hidden” url of our backend services. Or an app that is storing sensitive non encrypted data in shared preferences or the database. If an attacker gain access to our device would be quite easy to get lot of personal information or critical for our business. Follow the guidelines for storing data of the official documentation. Exploit any vulnerability to intercept sensitive data while travelling across the wire. This includes communication using Bluetooth, Wifi, NFC, GSM, etc. As sensitive data we understand things like session tokens, account details, metadata, passwords, etc. As an example of attack scenarios we have seen apps sending personal information via non secure channels instead of SSL, or applications accepting connections even though certificates handshake fails. Some recommendations to mitigate this threats would be using SSL/TLS, strong cypher suites, certificates signed by CA provider, do not send sensitive information via SMS or notifications, etc. Once again for a more complete list of recommendations check the official Security with HTTPS and SSL and Network Security Configuration. In this category we include the bad user authentication and session management, like failing to identify and/or maintain the identification during the app life. Some ways to prevent these attacks: Ensure you always perform auth in the backend side, do not store credentials locally. If you need to keep any auth info in the device always do it encrypted. Do not use weak auth mechanisms like 4 digits Pin codes. So you are using cryptography but is not strong enough or your encryption process has flaws and weakness. In this scenario an attacker that have access to our device, if we are storing sensitive information encrypted but this is not strong enough or we are managing wrongly our keys, the data could be extracted and decrypted. To avoid this scenarios use a strong cryptographic standards, avoid (if possible) to store sensitive information, use hardware backed encryption (if possible), etc. Important here to understand the difference between Authorisation and Authentication. Where authentication is the process to identify an user, authorisation is the mechanism to check that the user has the right permission to perform a task. Weak or flawed authorisation process might allow an attacker to perform actions as administrator of the system. To avoid this scenario store the rules for authorisation only in the backend and do relay on device stored rules, perform authorisation checks when the app is hitting the backend on task requests, etc. Here as mobile developers is where we have a big responsibility. Poor code standards, either intentionally (taking shortcuts, workarounds, tech debt or even malicious developers) or unintentional (junior or low skilled developers) can end up in poor quality code. And this will make vulnerable to memory leaks, buffer overflows, etc. In order to avoid this maintain consistent coding practices, perform code reviews, use automated tools to detect leaks and other defects in the code base, implement a continuos learning and improving policy in your team, etc. There are different attack vectors in code tampering, like reverse engineering and modifying resources or even code source of the released app package, change dynamically the content of the memory at runtime of the app, replace the API that the app is using, etc. Applications like games are quite susceptible of these attacks for example to skip payment for paid versions of the game, new features, etc. For more information about this refer to this OWASP project. Hackers can download the app from the store and decompile our binary looking for source code, libraries used, assets, algorithms, etc. trying to find vulnerabilities and points of attack. There are a few tools and solutions that we can use to obfuscate and make reverse engineering as difficult as possible, like the well known Proguard or more complete and complex commercial solution like Arxan. An attacker can download the app and analyse it looking into logs, source code, configuration files, etc. and try to find extraneous functionalities. They will try to find hidden switches or backend APIs in order to perform an attack. To avoid this, before releasing the app check for any app configuration settings where you disclose switches or hidden back doors. Check for public logs disclosing sensitive information, check that all APIs are well documented and no hidden administrative or debug endpoints are available. As we have see the Android and others mobile platforms are not 100% secure. There are many attack vectors that hackers can exploit and we as developers have a massive responsibility to keep our systems and users safe. A security breach can destroy the reputation and even the whole company itself so let’s do all what is in our hands to prevent crime, be aware of the risks and develop software with security always in mind. As usual please leave any comments or suggestions that you might have. Rebuilding a legacy app from scratch (III): Clean Architecture. Once we have decided the features we want to have in our Minimum Viable Product version of the app, and before jumping straight away to start coding, we need to decide how are we going to design and architect the application. Why we need to implement a good architecture? Because we want the code base of our application to be testable, scalable, robust, modular and maintainable, among other things. Over the years a few architectures patterns has been defined and used by Software engineers for different platforms and systems but one of them that has gained lot of traction and popularity in the mobile community is the well known Clean Architecture. This pattern was defined by Uncle Bob and described in this blog post. Independent of Frameworks: We want to isolate the Android or iOS framework from our business / UI logic, making them testable and interchangeable. Testable: This has been one of the traditional issues when designing the testing strategy of our apps, it was difficult to test a module that has many external dependencies, like the Android SDK. Independent of UI: We want to have our UI independent from our business logic, this way the last one can be unit tested without having to depend on UI or Integration tests. Independent of Database: The source of data must be isolated from the rest of layers of the app, this way we can change this source without affecting the logic of the app. Independent of any external agency: The business logic doesn’t depend on any external factor. So for our Android implementation of the Clean Architecture we are going to follow the design described by Fernando Cejas in one of his great blog post. We are going to identify three main layers in the code base: Presentation layer, Domain layer and Data layer. We are going to use the Model-View-Presenter (MVP) pattern to implement this layer. I will explain briefly this presentation pattern but you can see a more detailed explanation in my introductory article here. Basically we are going to have a View entity, where we implement the Activities, Fragments and Views. These are what we call passive views, what means that they are totally dumb and have zero presentation or business logic. They just display information in the screen under the direction or the Presenter and dispatch events back to this one, like user actions. Then we have the Presenter that as mentioned previously contains all the presentation logic and is acting as a bridge between the View and the Model layer. This entity should not have any Android dependency, but it knows how to respond to user actions and how to retrieve the information or data that is required to display in the view. And finally we will have the Model layer that will contain the bridge and adapter classes accessing the Domain layer of our architecture. It’s going to contain all the business logic of our app. Once again there shouldn’t be any Android dependency in this layer. In here we will implement what we call Interactors, which basically are Use Cases. For example, if we look into the MadridBus application, we will see that one use case is to get the list and information of all the bus lines in the city. This logic will be implemented in one Interactor and it will be used by the Presenter of the Line List View. So when the user open the line list screen, the View is going to tell the Presenter that it has been loaded, the Presenter knows then knows that have to retrieve the line list, so it’s going to instantiate and use the GetLineListInteractor, which is going to access the Data Layer to get the list of lines. When the data set is returned the Presenter knows calls the View and tell it to display this information in the right way. In this layer is where all the data of the application is stored and processed. This layer is responsible of providing the mechanisms to retrieve the data that the app needs. The Interactors will be calling the API of the data layer so they can retrieve this data to the Presenters. We want to make the data source totally agnostic for the rest of the different layers of the app. This means that the Interactors doesn’t know from where the Data layer is extracting the information, they will just call the interface of the API exported following the Repository Pattern. For example, in the app we are going to have two sources of data, the first one will be the Cloud, from the public transport agency data service. Then we will have the local database, where we will save the data taken from the cloud, so the next time when the GetLineListInteractor call the Repository to get the list of lines, if this exist in the local database, it will retrieve from there, and if not it will retrieve it from the cloud. To read more about the repository pattern check out this great blog post from Hannes Dorfmann. One importante aspect when designing our code base which is dependent on the architecture of the app is the structure of the different modules and how are they grouped in the project. As Uncle Bob says, this is like a blue print of the application. Looking at the project structure should give us an idea of what this system is about. As we can see in the screen shot, the project has four main module groups: DI, Domain, Model and UI. In DI we have all Dagger 2 dependency injections helpers. Domain as we have mentioned before contains the business logic, interactors, network modules, rules, etc. In Model basically we have Pojos and data classes. Finally in UI we have all the Presentation layer modules, like Activities, Presenters, etc. With this project structure we can easily find and navigate to a specific feature or functionality of the app, either the UI part, the Domain or the Data component of it. A good architecture is the blueprint for our project, it will guide our implementation and will keep the maintainability, testability, cohesion and modularity of the project. Clean Architecture is not the silver bullet nor the only way to design our apps, but has proved to be one of the best solutions. We will be following this pattern in the MadridBus source code implementation that you check out in Github here. Continuous Integration (CI) is a Software engineering practice where developers in a team continuously integrate their work in the main stream of source code at least once a day. The main goal of the CI practice is to reduce the integration problems that quite often happen when we have a team of several people working in different features and parts of our system. The sooner we integrate our code the easier is to identify problems like dependencies between modules, compilation issues, regression, duplication in code, etc, etc. Continuous Integration is overall an attitude and good Software practice. In order to achieve it we need some tools and organisation. First of all we need our source code in a repository, in our case to maintain MadridBus app we are using Github in a public repository. Next we need a platform to perform the automatic builds of our code every time we push code to the repository. For our app we are going to use Travis CI. Travis is a hosted distributed CI platform, it’s free for public repositories and it’s quite easy to integrate and configure in our project. Finally we need a good suite of Unit Test that are going to run every time a new build is launched, that as we mentioned before is going to happen for each push that we make in our repo. We will talk about the testing strategy in further posts but in the mean time you can take a look to one of my previous posts. So first thing is going to https://travis-ci.org/ and we sign in with the Github account where we have allocated the Android project. Then we are going to select the project we want to set up with continuous integration and that’s pretty much it, we can start building! But not so fast, probably your build is going to fail as we need to set it up properly for Android projects, and the way to do this is adding the “.travis.yml” configuration file. Right, so let’s take a look to the interesting parts. As you can see in the first two lines we are specifying the project type with “language: android” and the JDK version 8 to be used to compile with “jdk: oraclejdk8”. Right now by default Travis will build our project with Android SDK 24, so if we want to install and build with a latest SDK and use any other additional component we need to specify it as we can see it in the section “components” under the “android” tag. As you can see in the example we are indicating that we want to use Build Tools version 25.0.0, Android SDK 25 and also that we are using Google Play Services adding “extra-google-google_play_services”. One important thing here is to tell Travis to accept all the licences when installing additional components, otherwise the build will fail. For this we are adding the section “licenses” as you can see above. Finally we want to launch an emulator so we can run the tests. To accomplish this we are adding the section “before_script” where we are launching and waiting until is running for the emulator with the image type as configured in the field “sys-img-armeabi-v7a-android-$ANDROID_API_LEVEL”. And that’s it! We just need to push new code to the repository and Travis will build automatically the project and run the tests for us. In next posts we will see how to add our testing strategy including Unit Tests with JUnit, Integration Tests with Espresso, mocking with Mockito, etc. MadridBus was the second application that we released in Quoders to the app store. It is an adaptation from the original BilbaoBus, an app to get public transport information like routes, stops info, timetable, etc. It was born just as a learning side project but we got good traction from the beginning and it grew up having more public transport agencies, improved UI, etc. On the other hand MadridBus wasn’t so popular, probably because there were already a few decent applications in the market for the city of Madrid, so we didn’t focus so much on it. As a result, now days the app looks and feel really outdated, the UI is clunky and the plumbing of the app are really ugly and not maintainable. So for this reason I have decided to rebuild the app from the scratch as one of my side projects. It will be open source published in Github. I will be explaining here in the blog all the design and implementation decisions, the different techniques, libraries, etc. The goal, apart from having a new and better application, is to have a project that could be a reference for new Android developers and hopefully help them to have a better understanding in how to implement from zero an Android app following good practices, patterns and explain the usage of Android concepts and most used libraries. In this post I am going to give a quick summary of the different features, patterns, design and other elements that I am going to use following the best practices and modern Android development techniques. In following post I will be describing in more detail each of these elements and explaining the implementation and the source code will be available on Github. So first thing first, let’s define the MVP (Minimum Viable Product) features and requisites. Go To: This feature allows the user to search a route between point A to B, either pointing in the map or searching by address. This functionality, despite being really useful when you don’t know the city or the best route, interestingly it’s not very used as our Google Analytics data reveals. Line List: Display the list of all the lines (day and night) available and allows the user to see the stops for a specific line and then the next bus time. Stops List: Display a list of all the bus stops in the network. This functionality again is not really very useful, unless you know the name of the stop and want to look up. Favourites: This is really useful as the user can save here to have quick access to the favourites stops, like work, home, etc. News: Display a list of news fro the rss service of the bus agency. Useful when there are disruptions, changes, etc. So for the MVP of the new app, taking into account what features the users are really using in the published app, I’m going to go for the Line List, Favourites and News. Also we will be releasing an Android Wear app that will displayFor the V2, we will be adding the Go To feature and maybe the Stops list. A public transport application needs to work with an extensive and complex source of data containing lines information, time tables, real time, geolocation, etc. The first one are static data that needs to be downloaded periodically and stored in the device for quick access offline. This set of data contains the bus lines info, route s, stops position, etc. The second type of data are the real time information, this will be accessed when we needs to display the real time info of the next bus for a specific stop. To accomplish this network access we are going to use the well known library Retrofit from Square. There are other options like Volley from Google but in my personal opinion and as you can see in some reviews like this, Retrofit is much better option. For more information you can check my blog post about Retrofit. For the data storage on the device we are going to use a local data base managed with the library Realm. Databases in Android usually is a pain to implement using the SQLite API, but with real we simplify and make more robust and less error prone our data base implementation. It supports multithreading, encryption, reactive extensions, etc. So now let’s talk about the UI layer. As we mentioned before, for the version 1 we are going to implement just the Line list, Favourites and News functionalities. We can see clearly three different features that will need three direct access from the home screen. So following the Material Design guidelines we are going to use the recently added Bottom Navigation widget that will give us access to the three different features of the app. As we can see in the documentation, this component is recommended for between three and five sections. In case we needed more is recommended to use a Tab view component or maybe using the left navigation drawer. So the first option is the Home view and it will display a Google Maps showing the location of the user and the nearest bus stops. The second option will be the Line List, using a Recycler view to display the lines info, and the third option will be News screen, again using a Recycler view. We will post designs and wireframes in a future post when we start implementing this. The MVP is now days one of the most used patterns in the Android community when it comes to organise the UI layer. There are multiple benefits like much more modular, reusable and testable code. For a complete description and explanation of the pattern take a look to one of my previous blog post. As a quick summary, the Activities, Fragments and custom views will be the View layer of the pattern and they will contain only pure UI functionalities. The Presenter will be a man in the middle layer that will work as intermediary between the Views and the Model. They will respond to events and actions from the user on the View and it will perform any action required using the Model layer. So as we are going to have different layers in the app following we need some mechanism to communicate with each other, passing data, etc. There are different ways to accomplish this, we have just the traditional way using listeners, but we agree that this comes with many problems and we end up with the infamous hell of listeners. Another better solution would be using an event bus, but this again has its own downside. The code end up being less readable it grows up having multiple events dispatching from everywhere with unexpected results. There is a better solution and will be using RxJava. As we know it’s one of the library and techniques that has focused the attention of the Android community for a while now. We will see in a future post and in the code of the app how to use RxJava and how to architect the app using it and all the benefits that it has. In the mean time you can have a look to my blog post about it. Testing is often one of the most neglected aspects of the applications development process. For our application we are going to implement two main type of test: Integration Test using Espresso (UI test) and Unit Test when relevant with JUnit. For more information about a good testing strategy take a look to my blog post about it. Continuous Integration is another key piece of our app development as it allows us to have a build of our app everytime we submit changes to the code repository. This way we can launch our tests suite every time we make a change in the code validating it’s correctness. For this functionality we are going to use Travis, a CI platform totally free for open source projects. Once again we will be explaining the configuration in next posts. So that’s it for today, as mentioned before we are going to be publishing blog posts to comment and explain the implementation of the different parts of the new app as we progress coding it. Reactive programming is one of the hottest topics amongst the Android community these days. Lot of big guys in the industry are embracing and using RxJava in their platforms and applications, even Google has release their own version of a reactive library called Agera. One of the problems of Rx programming is the initial learning curve, the complexity of the paradigm itself and the extension of the library operators and classes. The goal of this post is to make a very simple and easy to understand introduction with some examples and be able to start programming and design our apps using RxJava. RxJava is just a library that implements ReactiveX extensions, which basically facilitate the implementation of asynchronous programming using observables data streams. It can be described as a combination of the Observer (there is one entity emitting data and one or many listening or it) and Iterator (the data flow are dispatched in onNext events sequences) patterns using the Functional Programming paradigm (we get data in declarative style methods and avoiding mutable objects). Abstraction of complexity of async data flows and events. It’s quite common to fall into the hell of nested and multiple listeners, the hell of multiple events from everywhere when using an event bus, etc. With RxJava we can simplify all this using just asynchronous stream of transformable data. Filtering, composition, transformation. Thanks to the massive amount of operators we can easily transform any stream of data transmitted. As we will see later we can filter, combine, transform, create, etc. any kind of data stream. Error handling. Very straightforward error handling by centralising in a single callback method any error, stopping the data sequence. Easy testing. Having a single source/destination of the data source and testing helper classes make it quite easy to test. Light and high performance. RxJava is light and fast, at the moment it weights around 1 MB and it’s quite fast streaming our data. So let’s take a quick look to the key elements that compose the RxJava library. This is the data source, the object that will be emitting the sequences of data items that the entities who are interested in the data they provide, will be subscribing. It implements all the operators mentioned before to be able to transform the data streams. Observables can be divided in two types: “Hot” observables which might emit data as soon as they are created and “Cold” observables which wait until an Observer subscribes to it. This is the type of object that will be subscribing and “observing” the data emitted by the Observable, they will “react” somehow using the data provided. Typically they implement the three main events OnNext, OnError, OnComplete as we will see later. More info in the official reference here. These is one of the key and most powerful features of RxJava. There are quite a lot operators of different types that will help us to manipulate and transform in many ways the data streams. We can group them in different categories such as Creating, Transforming, Filtering, Combining, Mathematical, etc. For a complete list of operators take a look to the documentation following this link. The Schedulers will help us to implement multithreading in our data streaming. Calling the Observable method “SubscribeOn” and indicating one of the Schedulers we can select in which thread the Observable will do it’s data stream job. On the other hand, calling the method “ObserveOn”, will set up the thread where we will be receiving and observing its data stream. In RxJava the most common Schedulers are “NewThread” (create a new thread for each job), “io” (for input/output operations), “computation” (event-loops, callbacks processing, etc), “immediate” (perform the job immediately in the current thread), etc. A Subject is object that is able to act as Observable and Observer. It can emit data streams and at the same time can subscribe to another data stream source (Observable), so we can think in it like a sort of bridge between two data streams. For our first example, we have a method that create a list of numbers and in order to simulate a long operation, we have added a 100 milliseconds thread pause in the loop. As we can see, the Observer implements three fundamental methods: onNext will be called when the Observable emit an item. onCompleted will be called when the Observable has finished emitting data. And finally onError will be called if there has been any exception or error when emitting data. And that’s it! When the getOddNumbers() method has finished the calculation of numbers and return, the Observable will dispatch the list of numbers and the Observer will receive the data. So this has been the introduction and basic operations with RxJava. You can find all the examples in this public repository. In next posts we will be looking deeper into more elements of the Reactive extension, like the Operators and Schedulers, etc. In the mean time please leave here any comments, suggestion or corrections you might find! In a previous post we made a brief introduction to the MVP architectural pattern, describing how it help us to create a much cleaner, testable and modular source code for our application. In this post we are going to talk about the MVVM pattern and explain how using the new Android Data Binding Library we can achieve the same level of modularity and separation of concerns but one step ahead, making the data binding with the UI layer less verbose and straightforward, which will produce source code less prone to errors and bugs. Model-View-ViewModel is a variation of the MVC and MVP patterns initially described and implemented by Microsoft to be used on the .NET platform, specifically with WPF and Silverlight technologies that makes use of the XAML language to implement User Interfaces. In the Microsoft ecosystem one of the main advantages of this pattern is that the designers can implement the View working completely independent of developers using Blend, which is an amazing UI IDE. Then developers can focus only on the ViewModel and Model and wiring everything with the Binding functionality. This in Android is much more difficult as the UI designer tools are not powerful enough. Like in the MVP pattern we separate and architect our code in three well defined layers. The View defines the pure user interface and it has no logic at all except any related only to the UI. If we focus on the Android platform in this layer we would have Activities, Fragments, Dialogs, Views, etc. As we saw in the MVP post these entities will implement an interface that will be use as bridge with the ViewModel layer. The Model integrates our data strategy, backend support, pojos, and generally speaking what we all know as business logic. These will be implemented via Interactors which defines uses cases of the domain logic. And finally we have the ViewModel which differentiate this patterns from others. Conceptually this layer is in charge of the same logic as the Presenter in the MVP, which is acting as a facade and brain between our data model and the user interface. It will be able to identify the application status and display or fetch data and information using the View and the Model. The ViewModel knows how and where to display the information in the user interface. Also it knows where and how to get this information from the Model. But the main difference is how this data are passed from the model to the View, which in the VM happen using a mechanism called Data Binding. Data Binding is a mechanism where a view component is linked to a data entity of the ViewModel without having to implement specific code to transform or assign this data to the visual component. We can send and receive commands and events and also connect data source to the component. In Android this magic happen thanks to the recently added Data Binding Library. As we can see, one of the main advantages of using Data Binding is the time we save due the amount of code that we don’t have to implement to connect the data and the view and hence the possible bugs and code defects that we will avoid. First thing we need to use the Android Plugin for Gradle version 1.5.0-alpha1 or higher. Then we configure the app to use the data binding feature in the build.grade file. Now we need to add the data binding to the component that is going to display the data that we need. For this example we will use two TextView which are going to display a user name and email that we will fetch from a web service using Retrofit. Once we have the response from the server, this info will be automatically updated on the view. There are multiple possibilities like binding collections, resources, automatic setters, etc… But all this due its extension will be the topic of another post! You can find the source code with this example here in the FragmentMvvmExample. To check out how to implement the division of layers on MVP / MVVM have a look to my previous post. As usual all comments, suggestions or critics are more than welcome, please leave your comments! As the Android platform has been maturing, developers found that the standard approach to organise the architecture and design of the application code wasn’t the best at all. Usually we ended up having a massive monolithic module, an Activity or a Fragment, containing business and UI logic, creating an unmaintainable and untestable messy project. Google itself haven’t provided so far a good practice guideline or code examples showing a modular and decoupled approach that implements any of the well known and widely used design patterns, like for example MVC which is encouraged by default on the iOS platform or the common MVVM in Microsoft environments. One of the most common pattern that the community of Android developers has been using for a while and that has got lot of attention is the Model View Presenter (MVP) pattern and we will focus on it on this post. We will not go through a deep academic description of the pattern but we will focus on the advantages and practical use of it. 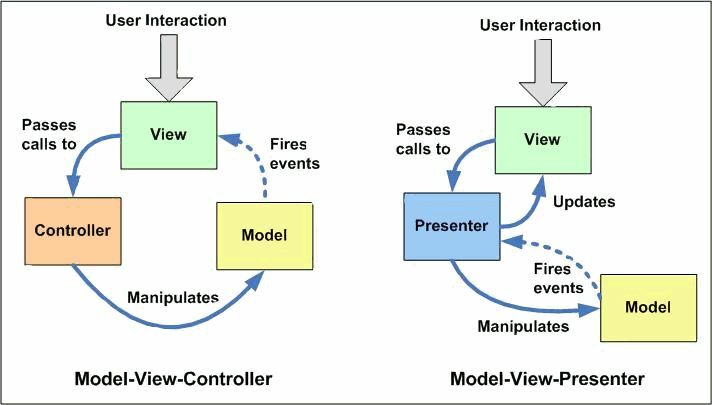 For an awesome analysis of the MVP and other patterns take a look at this classic post from Martin Fowler about GUI architecture. Basically MVP is an architectural design pattern that divides our application code in three entities in order to achieve a modular design, implementing the separation of concerns concept, allows an easier implementation of unit tests and making possible to reuse and replace modules either of our UI, data or business layer. MVP is an evolution of MVC and it has multiple variants and implementations. There has been a lot of conversations and debate about the best and proper way to adopt it on Android. I’m going to expone my way which I have been using in a couple of projects and I reckon works better for me. Of course it doesn’t mean is the best or only one that works on Android, so please leave any comment and suggestions if you find any area of improvement. Ok so let’s see who is who in this approach. This entity is going to include the visual part of our app, it is only the UI and it will not have any logic or knowledge of the data displayed. The View doesn’t know anything about the business logic or how to get the data it has to show to the user. Activities, Fragments, Dialogs, etc… would be included in this category. This elements will contain only initialisation and display functionalities of the visual components and elements to display information to the user. It will not contain any functional or business logic like access to database or web server for example. As we mentioned before, this entity is going to have all the logic and knowledge about what, how and when to display in the user interface. It will be responsible of capture events raised by the user when interacting with the UI and perform any action. The presenter also acts as a bridge between the View and the Model fetching any data needed from the data layer, making any transformation and display this info to the user on the View. This entity ideally shouldn’t have any dependency of the Android SDK such us Context or Activity references. The Activity will have a reference to the Presenter interface and it will use it to communicate any event occurred on the View, like the user tap on a button or the user enter any data in a TextView and then it will decide what to do in reaction of that event. So for example let’s say that if the user tap on a Logout button, the View call the exported method “onLogoutClick” of the Presenter interface. Then the it knows what interactor of the Model layer needs to invoke to perform a Logout action on the app. Once the log out success callback has been received, the Presenter will perform any action on the View, for example closing the Activity and displaying a home screen Activity. In this entity we will include the “interactors” (use cases of our business logic) that will perform and manage any business layer logic and data access, like fetching data from our web service, accessing the database, etc. Once we have that piece of data the interactor will send it back to the Presenter and this will decide what to do with this data and how to show it to the View as we saw in the previous point. So this is a very brief summary of what is MVP and how to use it on Android to achieve a cleaner, modular and testable source code. This is just an interpretation of the pattern and is not a silver bullet or the perfect solution for our apps, so any comments or critics are more than welcome! To see a practical example of the pattern used for the Welcome screen and login functionality check this folder. One of the most common features that we usually implement in our apps is the ability of the user to share the app with friends. This is a great way to make our app grow and a free mechanism of user acquisition. Normally we have implemented this functionality with some kind of custom message and allowing the user to send it by email, text message, etc. 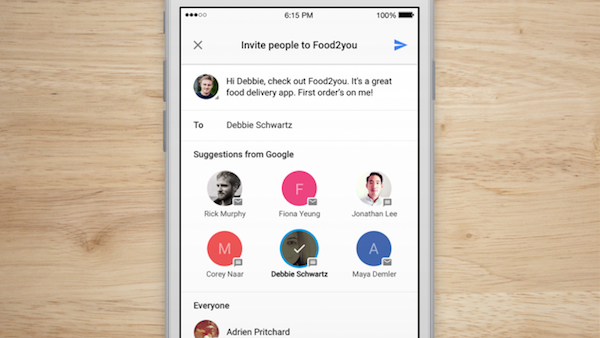 Now we can achieve this with a much better user experience and customisable way using the new Google App Invites Beta API that was announced in the last Google I/O 2015. 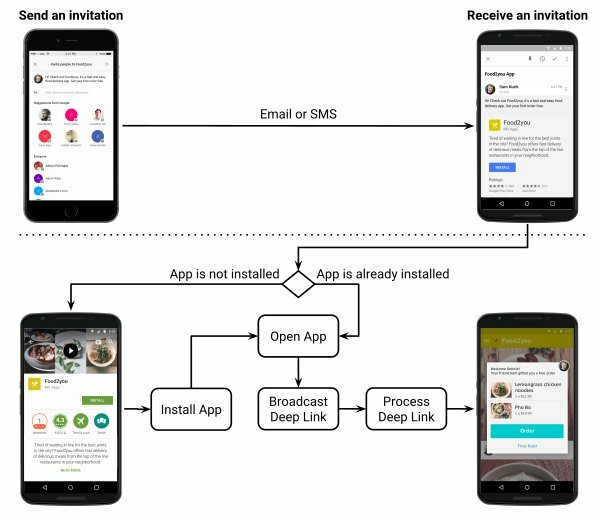 With App Invites we not only can share the app but also send deep links, customised invite cards, link with Google Analytics to track the flow, etc. Right, next thing we need to add to our project is a Json configuration file that we will get from Google that provides service information specific to our app. To do this we will have to add in the Google Developer Console our application package name and the SHA1 key from our key store. Click here to access the dev portal to do so. Once we have the configuration google-services.json file we just need to copy it into the app/ or mobile/ directory of our project. Ok, so now that we have finished the integration let’s do the funny part, and send an app invitation. If everything went well, when we launch our app and we launch this intent we should see a really nice interface that will show the user’s contacts list and the option to send the invite. So that’s it! This is just an introduction but there are more interesting options to explore as the integration with Google Analytics, deep links features, etc. You can find an example of the integration and use for Android in my examples project here. And as usual any comments and feedback are more than welcome! In a previous post I described how to implement HTTP requests using the Google’s library Volley. We saw how to save lot of boilerplate code in such a critical part of our apps like the networking communication with our server using a well tested and reliable library. We showed how straightforward is to have so useful features like parallel HTTP requests, cancel petitions, image downloads caching, etc. But Volley is not our only option, there are more libraries out there that does a really good job, and one of the well known and widely used is Retrofit from the Square people. In this post you can find a very good comparison between the two libraries where Retrofit would win as it is faster that Volley, but you better try and test by yourself and check which one would fit better on your project. You can find here in my AndroidBootstrap project in Github how to integrate the library in an Android Studio project and a few examples of use. Retrofit uses Java interfaces and annotations to define the REST API requests. Then it will generate the necessary code thto perform the HTTP requests and finally will convert the Json response in the specific pojo object using Gson. As you can see “@GET” specifies the type of request and “/comments” is the path of the request. Then we have the “@Query” annotation that specifies the addition of a param to the url which will take the value of the param “postNumber”. Finally we can see the Callback parameter where retrofit will retrieve the object that has been created from the Json response using the Gson library. So this is a very brief introduction to the Retrofit library. As mentioned before you can find examples of the use and integration in my Bootstrap Android project. I’ll be adding more examples of useful libraries or snippets in the future. And finally if you have any comment or suggestion please don’t hesitate in leave it below!